One of the standout new cars at the 2019 Geneva Motor Show was undoubtedly the Koenigsegg Jesko, but the official photos released by the Swedish automaker showing the hypercar against a plain white background didn’t do it justice. We were fortunate enough to see the Jesko in the flesh, but Koenigsegg has just released a new gallery of photos showing the hypercar in Lucerne, a picturesque town in Switzerland, taken by photographers Eric Griess and Steven Wade during a recent photoshoot. We think you'll agree that any of these photos would look great as a background for your phone or desktop. Koenigsegg’s latest hypercar replaces the Agera RS and is named after Jesko von Koenigsegg, the father of company founder Christian. Under the hood is an updated version of the company’s 5.0-liter twin-turbo V8 that produces 1,280 horsepower on gasoline or 1,600 hp on E85 fuel. This makes it most powerful internal combustion engine ever fitted to a homologated production car. The powerplant is mated to a transmission with a unique multi-clutch, non-sequential nine-speed design. While most dual-clutch transmissions need to shift through each gear, Koenigsegg's design can skip cogs that aren't necessary. For example, you’ll be able to shift from eighth to fifth gear without transitioning through seventh and sixth gear. Only 125 examples are planned for production. But despite costing around $3 million, the Jesko sold out just two weeks after its world debut. 83 cars were sold before the show, with the remaining examples selling within five days of the car’s debut at Geneva. 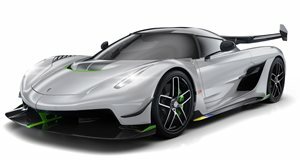 This isn’t even the fastest version either, Koenigsegg is already planning a more powerful Jesko that will break the 300-mph barrier.